The Keystone Clinic provides professional private counselling and psychotherapy, as well as offering a range of education, training and development services to organisations, families and individuals. 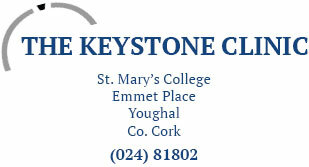 The Keystone Clinic strives to meet international best practice and always works within recognised codes of ethics. The Keystone Clinic’s practitioners are trained to an exceptionally high level and are accredited members of the Irish Association for Counselling and Psychotherapy. This means that you can expect a professional service. The Keystone Clinic’s outreach programmes aim to promote positive mental health awareness to wider audiences. We offer a wide range of specially tailored programmes.